Izumi is Royal Caribbean's Asian-fusion specialty restaurant. The concept for this venue was developed for Royal Caribbean by celebrity chef and restauranteur Travis Kamiyama, who has made a lifetime study of sushi. With Izumi, he sought to bring to sea a venue that combines Edo-style sushi with contemporary flavors and dishes originating in the Pacific Rim countries. The restaurant first appeared on Oasis of the Seas. However, as part of Royal Caribbean's fleetwide revitalization program, it has been added to several of the ships that pre-dated Oasis as they have come in for refits. On Legend of the Seas, Izumi's is located in the forward part of the Viking Crown Lounge - - the disc shaped structure that surrounds the funnel on the Royal Caribbean ships. As a result, through its floor to ceiling windows Izumi offers spectacular views over the main pool deck, which is especially pretty at night when the lights of the pool deck come on. 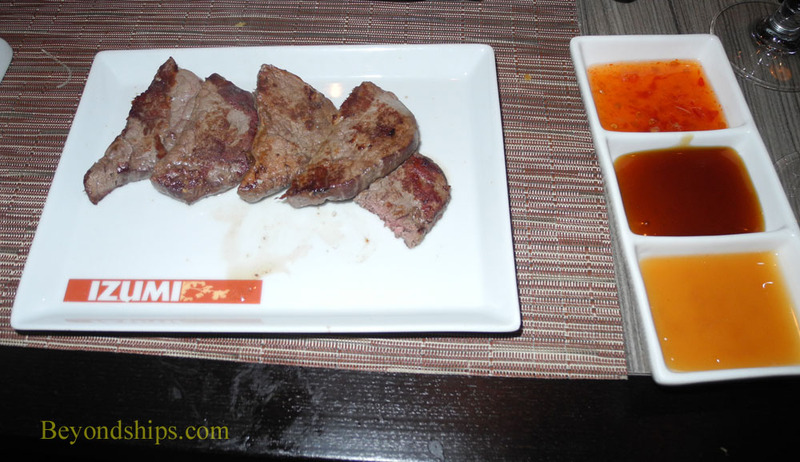 Izumi shares the Viking Crown area with the ship's nightclub and with the Chops Grille Steakhouse specialty restaurant. 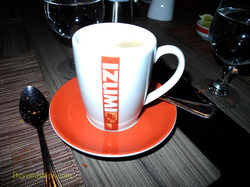 However, the space has been economically and thoughtfully used so that Izumi feels intimate rather than crowded. Its décor is contemporary but with Asian-inspired accents. Nice, soft lighting casts an almost magical spell. There are no tablecloths, rather there is a bambo mat marking each guest's location at the table. The place setting includes small bowls and chop sticks. Silverware is not present but is available upon request. A white porcelain bottle containing the chef's own blend of soy sauce is also standard on each table. 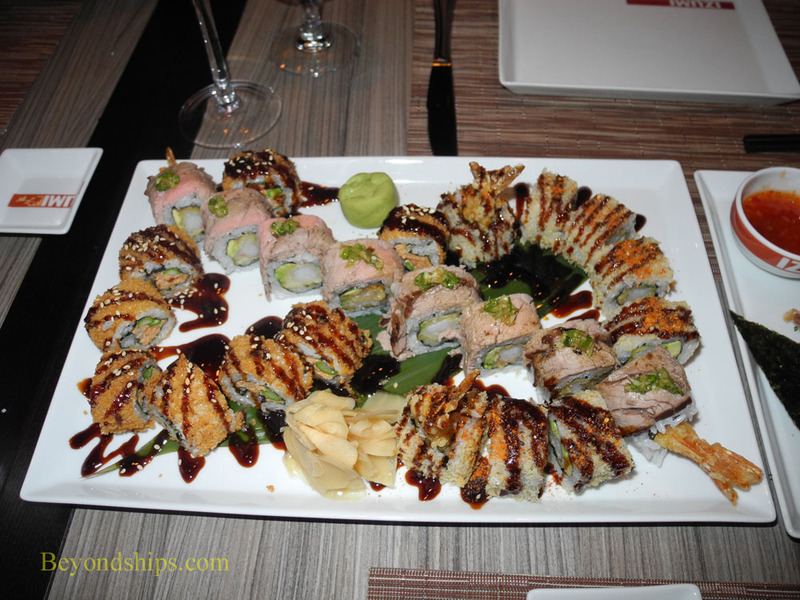 The menu at Izumi resembles a small book and contains sushi, sashimi, rolls and other items that tempt you with words like lobster, shrimp and surf and turf. There are also soups and salads. All of this can be somewhat bewildering to first-timers. Therefore, a wise move can be to accept the waiter's offer to create a sampler plate that can be shared by all at the table. We found the shrimp firecrackers were the most popular of the preliminary items. These were crunchy, deep-fried spring rolls with crabmeat, spicy sambal chili, creamcheese and, of course, shrimp. The centerpiece of the meal is the “Hot Rocks.” Each guest is presented with a tablet-shaped, flat, volcanic stone, which has been heated to 600 degrees. On these stones, each guest can cook the beef, chicken, shrimp, or fish that he or she has ordered. We admit to being skeptical about our ability to transform raw ingredients into something worth eating, much less something gourmet. In addition, there seems to be something not quite right about the concept of going to a restaurant and still having to cook the meal. However, this was not at all like rustling something up at home with ones pots, pans and/or microwave. Rather, after a few seconds on these unusual stones, the raw ingredients had become tasty morsels that disappeared all to quickly. The flavor of something that has gone from cooking stone to plate to mouth in a minute cannot be matched. Moreover, the waiters in fact did almost all of the cooking. For dessert, we enjoyed the banana pancake. Caramelized pieces of banana contrasted nicely with vanilla ice cream and a soft fluffy pancake. For those who cannot bring themselves to choose between Izumi's various dessert offerings, the restaurant offers a sampler plate. 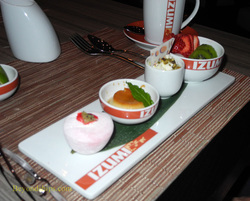 The dessert sampler, like many of the other dishes at Izumi, was presented in a visually attractive manor. Each item in this sampler was arrayed on a long rectangular stone spaced with military precision. The care and imagination displayed in this and other presentations during the course of the meal enhanced the experience, helping to move it beyond the ordinary. Likewise, the friendly and attentive staff, who patiently guided us over unfamiliar terrain were key to making the experience an enjoyable memory. The pricing at Izumi is not like that at most other sea-going specialty restaurants. The five dollar cover charge only gains you admission to the restaurant. After that, you pay per item like you do at most shoreside restaurants.